935M Apartments in Atlanta make luxury living in a busy city delightful and affordable. 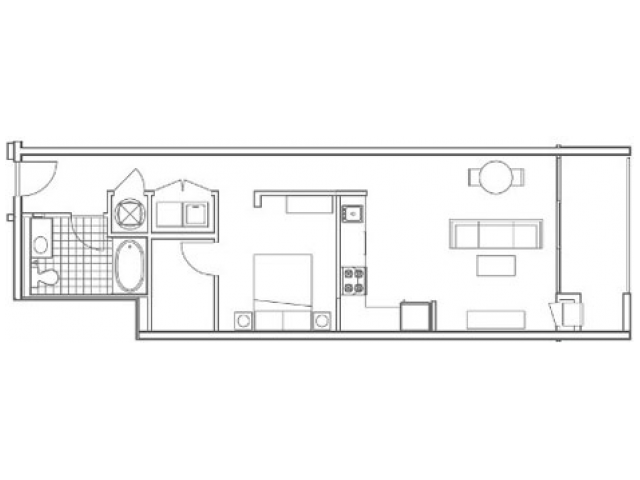 With the floor plan of the A6 Echo, you have a one-bedroom, pet-friendly apartment in a great neighborhood, packed with high-end amenities. Pair that with 850 square feet of and you have a great fit for your new apartment. The A6 Echo has 10-foot, floor to ceiling windows that boast great views of the Atlanta skyline. Our gourmet kitchens are a standard feature in every apartment as well as granite countertops, and energy efficient, stainless-steel appliances. In making the A6 Echo your new home, you will also have washer and dryer hook-ups, walk-in closets and a deep soaking tub. 935M has created an oasis for living in one of America’s busiest cities. 935M Apartments are located near Georgia Tech, making the A6 Echo a perfect option for students and staff. The west side of Midtown is a perfect location to live as it is just far enough from the interstate that you won’t feel the hustle of Atlanta, but close enough to walk to local restaurants like Pauley’s Crepe bar and shops. The proximity to I-85 has the rest of Atlanta conveniently at your doorstep. 935M Apartments is so much more than an apartment complex. We are a thriving living community designed to enrich your life. Our yoga studio, secure bike center, and Torq Cycle retailers, who are on-site, offer something for those with an active lifestyle. If you like entertaining, then our resort-style pool, spacious outdoor grilling area and resident’s lounge give you perfect spaces to share with your friends and family. We are proud of our friendly staff, who take the time to meet the needs of our residents with care. If any services or requests come-up, you have a convenient portal for maintenance request, and to pay your rent. At 935M, easy living is at your fingertips. Stop by today for a walk through and tour our facilities.